American network Home Box Office (HBO) has teamed up with dating app Bumble for their latest campaign and we’re buzzing at the idea! 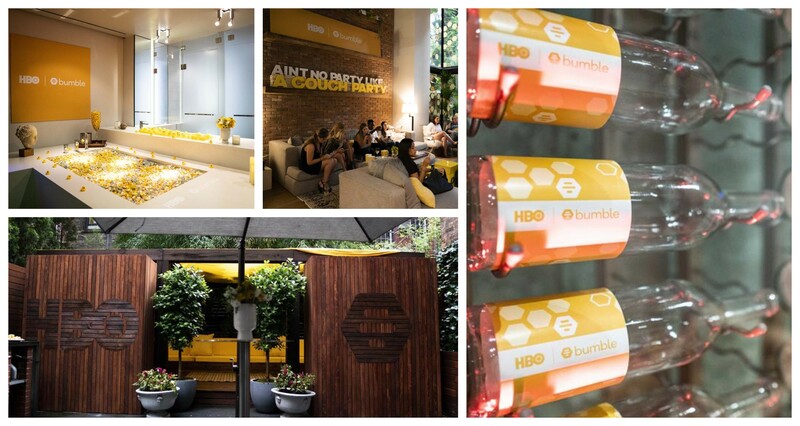 With the aim of showing off their range of movies, HBO invited Bumble users to a luxury million dollar apartment in New York for the ultimate stay at home movie experience. Daters would simply fill out a personality quiz. This then allocated them a new must-see movie based on their preferences. Bumble users swarmed over at the chance, with the waitlist registering at 1,200 for only 65 spots! Partnering ‘movie night’ with ‘date night’, a wall filled with co-branded wine bottles surrounded the site. Even more to soak up, the event included a bathtub bursting with yellow and silver sweets and a popcorn machine (obviously!). As well as this, a quote wall asserted ‘Staying in is the new going out’ which was screaming for an Instagram share. An evening of movies, drinks and snacks – the only event where you go out to stay in.